Whitakers selection of necklaces and pendants are defined by dazzling centrepiece diamonds and delicate details of craftsmanship. Whether you are looking for an everyday look or something more extravagant, you will find a large range of diamond and coloured necklaces and pendants at Whitakers. Created using lasting materials such as white and yellow gold, Whitakers’ necklaces and pendants offer classic designs with unique style. 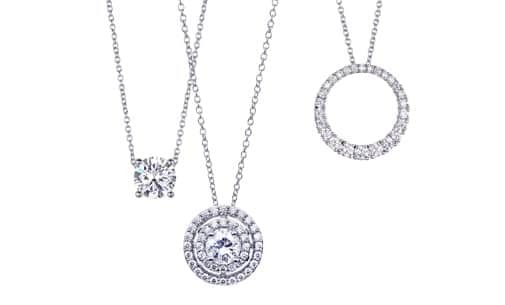 As a staple of the collection, Whitakers’ diamond pendants are a must have for any jewellery collection. From dainty handcrafted designs to elaborate statement pieces, Whitakers’ diamond necklaces and pendants are all about the finer details, which add an extra level of dimension and flair to each piece. Browse our collection of diamond and coloured necklaces and pendants online or visit our boutique store on Darby St, Newcastle.